Light the candle and allow it to burn all the way down. The next day, remove the spent candle and add any spare change that you may have accumulated. Remember to say “thank you.” Now, put the second red candle on top of the money, sprinkle the allspice, and say the charm. Do this for five days in a row, and your money magic will be activated, empowered, recharged, and amplified. 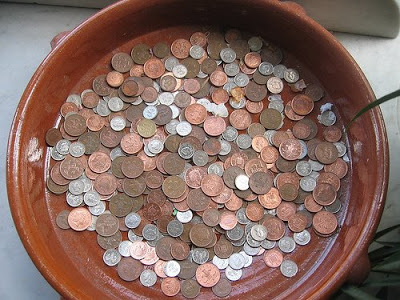 What if you end up with so much spare change that your bowl is filled with money before the 5 days are up? Or if you absolutely need to use some of it? No worries. You can take money from the bowl, just be sure to leave at least 5 coins.